BOSTON, MA – May 16, 2013 – Breakstone, White & Gluck, P.C., announced today that it will donate 750 bicycle helmets to youth in the Boston area, through programs in Boston, Somerville, Cambridge and Dedham. 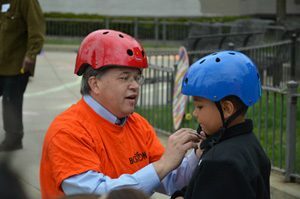 The firm will donate helmets this spring and summer through these programs: Mayor Menino’s Boston Bikes Roll It Forward program; CYCLE Kids of Cambridge; the Winter Hill Community School in Somerville; the Dedham Bike Rodeo and Bikes Not Bombs of Jamaica Plain. Read more about the bicycle safety programs our law firm will support this year. Breakstone, White & Gluck of Boston is a leading personal injury law firm in Massachusetts. The firm promotes safety through education and offers cycling safety resources on our website: www.bwglaw.com/bikes.